“Wall Street” is a street in New York City, near the southern end of Manhattan Island. It is the home of the New York Stock Exchange, and the biggest center of stock trading and finance in the world. 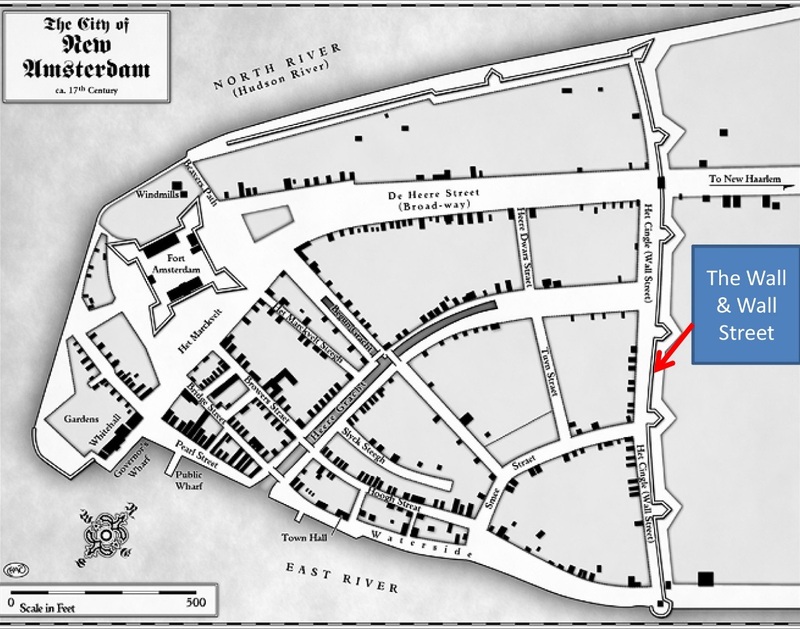 Before New York was New York, it was a Dutch colony called New Amsterdam , which only took up a small area in the south of Manhattan Island. As part of the town’s defenses, in the 17th century a wall was built near the town center. 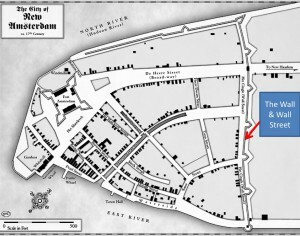 The street build along the wall was called Wall Street, and remained so even long after the walls were torn down and the city continued to grow. Over time, businessmen began to meet near the old Wall, at a buttonwood tree near the intersection of Wall Street and Broad Street. By 1792, most of the young city’s investors would meet here to trade Revolutionary War bonds, bonds issued by various state and local governments, and a small amount of stocks from the growing businesses in the area. Wall Street also had an important government function: in 1700, a new City Hall for New York City was built on Wall Street. As the American Revolution drew near, this building was also where the Freedom of the Press was established (with a lawsuit of the British government against a newspaper printer for libel, he was found not guilty because what he published was true), and where delegates from 9 of the colonies met to draft a letter to King George and the British Parliament in response to the Stamp Act, making the famous claim of “No Taxation without Representation”. After the Revolutionary War, the city hall became Federal Hall, and served as the capitol of the United States from 1785 until 1789 (where, among other things, the Bill Of Rights was signed). After this, it became a customs house, and later part of the Treasury system. It is now a national monument. 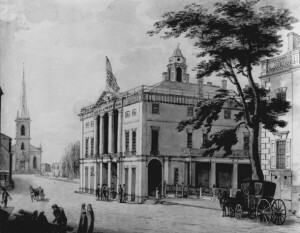 In 1817, the businessmen who had continued to meet near the buttonwood tree to trade Revolutionary and United States bonds (along with small amounts of stocks) pooled their resources to rent an empty building across the street from their old meeting place so they could continue to meet even when it was cold and raining. This building became the first home of the New York Stock Exchange. 1 of 3) What was the name of New York City when Wall Street was first built? 2 of 3) What was the most frequently traded security type in the early days of Wall Street? 3 of 3) Which of these buildings have NOT been located on Wall Street?